The themes ‘Internet of Things’, ‘Industry 4.0’ and ‘Big Data’ have become indispensable. Many industries are in the midst of a digital transformation. Also in the bulk goods industry, operations and processes will change through data analytics. The maintenance function is particularly affected. Thanks to data analytics, companies can better understand their machines than was previously possible through mere experience. Data analytics thus offers the possibility of more effective and more cost-efficient processes. data analytics create. The fact of the matter is that, at this point in time, it is not yet clear where the journey is taking us. The possibilities seem infinite. But the scenario of a fully networked factory is causing increasing uncertainty. A 2014 study by the Society for Consumer Research (GfK) commissioned by the Deutsche Zentral-Genossenschaftsbank (DZ Bank) showed that a total of 68% of respondents were especially concerned about the increasing demands in data security. Forty-five per cent consider too much dependence on the stability of technical infrastructure as a problem. The study showed that only about half of all SMEs (small and medium enterprises) are already dealing with digitization. A third of the respondents do not consider the issue as a whole as relevant for them. Finally, the study concludes, that in order to remain competitive, companies must seriously consider the issue of digitization. The greatest potential in the networking of plants and processes lies in reducing costs through the intelligent use of pre-collected data. For example, most companies already use data to obtain information on the condition of their systems and conveyor belts. Such condition monitoring helps to determine system malfunctions. ‘Cassantec Prognostics’ of Cassantec AG, Zurich, extends the utilization of this data. Prognostics uses the same data as condition monitoring, but reinterprets it. With the help of a specially developed algorithm risk profiles are created that give precise time information about when a potential malfunction may occur in the future. 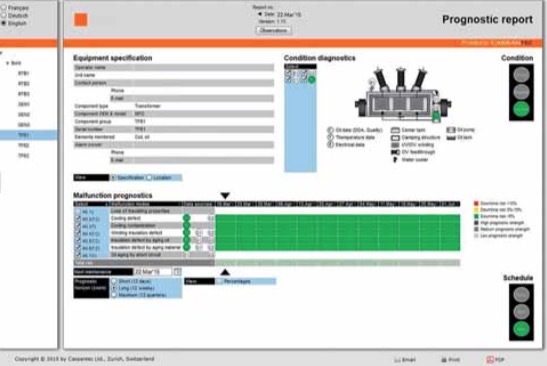 Such a method fundamentally changes the way machinery is deployed because decisions about maintenance management are made on a more transparent and objective basis. Whether consciously or unconsciously, humans make hundreds of choices every day. Gerhard Roth, a professor at the Institute for Brain Research in Bremen has determined that quite often gut decisions are the better choice. When choosing what to eat for breakfast or what to wear, that is perhaps the best way; however, for more complex decisions the basis should not be intuitive. Especially when decision-makers are faced with complex situations, data-based facts can put them on the right track. Algorithms help people solve complex problems such as the maintenance of equipment and help them make better judgments. At present, the basis for making many decisions is still often experience or intuition. Humans have their own ‘computer’, their brain. However, the brain is not immune to prejudice. Even factors such as the weather or the mood demonstrably and significantly influence decisions. Often many important characteristics are lacking for a proper analysis and assessment — an algorithm that is programmed in advance is subject to fewer such errors in reasoning. Information based on math offers the possibility for decision-makers to work with input that is objective, transparent and applicable to different situations. Thus, for example through the use of Cassantec’s Prognostic Reports, a foundation is created to make sound decisions for maintenance strategies, to pool maintenance interventions intelligently and to plan them in time to avoid unnecessary cost from a lack of preparation. Maintenance plans will no longer be created periodically and based on experience, but with a transparent, data-based structure. This saves companies huge cost. The development has just begun: society is at the beginning of a digital transformation. ‘Industry 4.0’ and the ‘Internet of Things’ offer enormous potential to change and exercise a positive influence over the way employees work. Yet technologies such as Prognostics also face challenges. The prudent application of prognostic solutions requires an extended skill set of reliability and maintenance professionals: the ability to articulate risk, to explicate forecasts, and to consider both in asset management decisions. Prognostics complements and requires operator experience and manufacturer know-how, but it also necessitates a shift in thinking and language towards a risk management approach. In the long run it is clear that companies and professionals have to face these challenge. Companies that have not already started collecting data for sophisticated analyses and that are not planning to make use of the new possibilities will eventually reach the point where they can no longer compete in the digitalized environment.